This month, Delta renewed its agreement as the New York Mets’ official airline through 2023. The airline flew the team all season and during two playoff series victories. Now, Delta has the privilege of carrying the Mets as they hope to take the last step to greatness this year: Their first World Series title since 1986. Distance: During the regular season, Delta has flown the team on 34 charter flights to and from road games, totaling more than 32,000 miles. That would be the equivalent to flying around the circumference of earth, then adding nearly seven trips back and forth between New York – LaGuardia Airport and Kansas City International Airport. In-flight service: The Mets receive specialized menus and access to seven cases of water bottles each flight – more than 5,000 bottles over the course of the season – to ensure the team is well-nourished and hydrated between games. 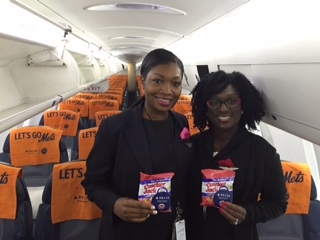 Game day on the road: Delta flight attendants on flights from New York to Kansas City Tuesday passed out Cracker Jack, stadium vendor style, to passengers. Mets rally towels were on all seats for customers. And there have been giveaways at New York airport gates and on board for lucky fans who could win signed jerseys and baseballs. Game day in New York: Of the 45,000 attendees who will fill Citi Field when the Mets play at home on Friday and Saturday, Delta will help 160 lucky fans skip game-day traffic with a co-branded water taxi ride, which will shuttle fans from Manhattan’s East Side to the stadium. Ticket-holding fans can follow @Mets and @Delta on Twitter later this week to tune in for clues on where to find water taxi tickets throughout New York City. Mets legend Mike Piazza and comedian and lifelong Mets fan Jim Breuer will be the honorary captains of the water taxi shuttle on Friday, mingling with guests on the short trip over to Game 3. Delta hopes to add the Mets to its recent roster of pro teams it has carried to championships, including the NBA’s Golden State Warriors (2015), NFL’s New England Patriots (2015), Seattle Seahawks (2014) and Baltimore Ravens (2013), and MLB’s Boston Red Sox (2013).